Product #3851 | SKU SM27 | 0.0 (no ratings yet) Thanks for your rating! 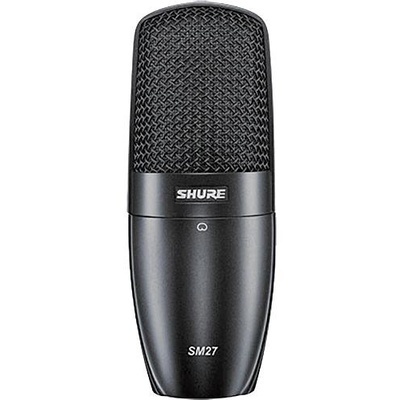 The SM27 Cardioid Condenser Microphone from Shure is a large diaphragm microphone for capturing vocals and instruments in project studio recording applications. Among the SM27's features is a cardioid polar pattern, -15 dB pad switch and 3-position low-cut filter switch. The cardioid capsule effectively minimises off-axis noise while reducing feedback and a -15 dB pad maximises headroom, reducing peak noise and distortion caused by transient (peaking) audio signals. The SM27's 3-position low-cut filter switch minimises low-frequency noise and proximity effect. Overall the SM27 is a modestly priced microphone that is sure to please musicians, vocalists, and experienced audio engineers alike.